Cabernet Sauvignon Wine Guide | Get Instant Cabernet Sauvignon Wine Expertise! Instant Cabernet Sauvignon Wine Expertise! your enjoyment and understanding of the king of red wines. 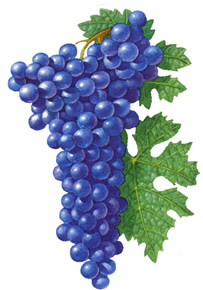 Cabernet Sauvignon wine and the Cabernet grape! A striking wine chart dedicated to Cabernet Sauvignon wine and the Cabernet Sauvignon grape! Each Cabernet Sauvignon wine chart is 18" by 24" (45.7 cm by 61 cm) and printed on heavy poster stock. The Cabernet Sauvignon wine chart is a full-color depiction of the Cabernet Sauvignon wine grape, and includes a complete range of aromas and flavors found in Cabernet Sauvignon wine. This beautiful Cabernet Sauvignon poster is perfect for framing!